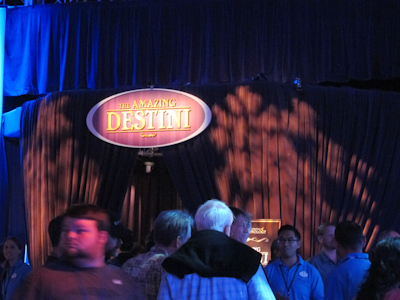 One of the things I liked most about the D23 Expo was the Carousel of Projects. It’s like the Carousel of Progress, except it’s projects, and it’s not defunct like the Carousel of Progress, and it didn’t move. And it wasn’t sponsored by GE. So basically the only thing it had in common was the name. ANYway, this was the pavilion for Parks and Resorts. It was all shrouded in curtains and had an eerie glow and stuff. You had to wait in line outside (shocking!) and they brought you into the curtained area in groups. It reminded me a bit of that “pay no attention to the man behind the curtain” part in Wizard of Oz. Once inside, you were in a circular area with movie screens arching across half of the room. My immediate thought was “Oh dear God, it’s going to be like Circlevision!” Which as you may recall, is the only ride that has actually made me throw up. 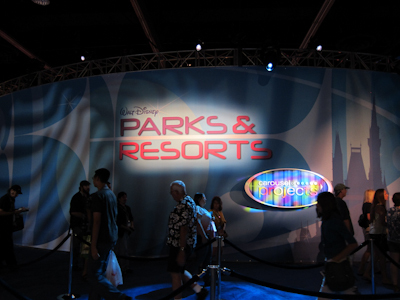 Fortunately it was just a big slide show thingy with different pictures of the parks and various projects. It actually made me really nostalgic. Then you threw nostalgia aside and entered the World Of Tomorrow-ish! Looking a little sparse there, folks. It was small and not very satisfying, since most of the attractions are either top secret or haven’t been decided on and designed yet. 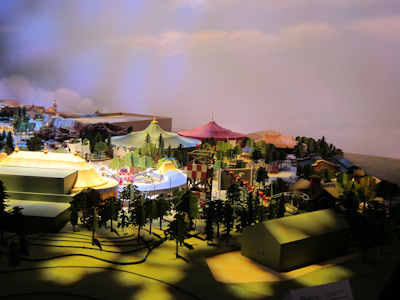 On the other hand, the model of the Mouse-in-Law’s new Fantasyland expansion looks abso-frickin’-lutely AMAZING!!! I mean seriously people, this looks incredible. I assume they're going to paint this or something. Heh. The coolest part is that the end arm is actually a joint for the passenger compartment to freely swing on its own. 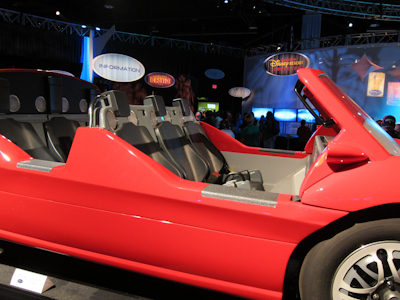 So rather than having the track do all of the car movement, your seats will actually swing back and forth on their own. Seriously. I want to ride that like right now. This fabulous convertible seats six! Yep, it’s the Lightning McQueen ride vehicle for the upcoming Radiator Springs Racers in the currently-being-constructed Cars Land at the Mouse-Next-Door! This ride is going to be massively awesome. It's like the real Lightning McQueen! 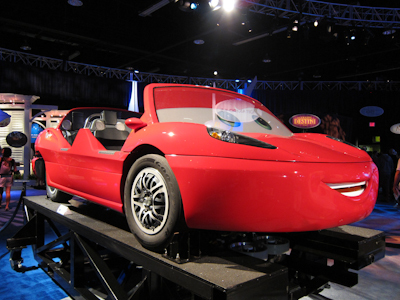 It’s based on the technology used in the Test Track attraction at Epcot, which was one of my favorite rides there. They also had some of Lightning’s friends. Theo LOVES fire trucks. He's going to go absolutely ape when he finally sees the movie. 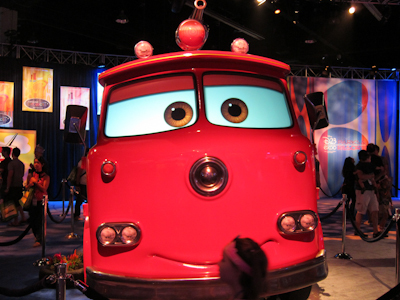 His eyes even move, just like Mater on the floor outside. 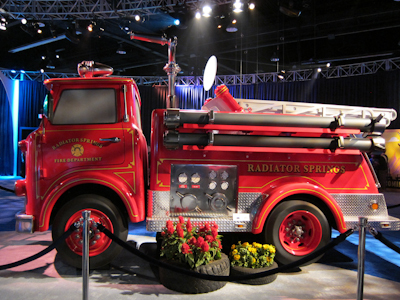 Who knew a fire truck could be so adorable? I wasn’t a huge fan of the original Mouse-Next-Door, but I am excited about all of the new construction and stuff they’ll have, like Buena Vista Street. The models were just so cool. Except for Shanghai Disneyland which was a little barren. Buena Vista Street is part of the massive overhaul of the Mouse-Next-Door. It’s to be the first “land” of the MND and will be similar to Main Street. 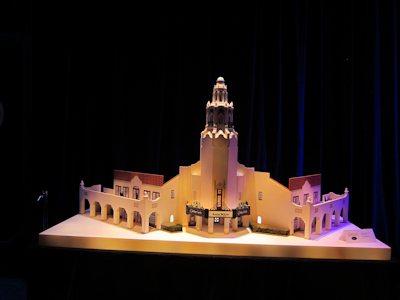 It represents the city of Los Angeles the way it looked in the 1920s when Walt first arrived. 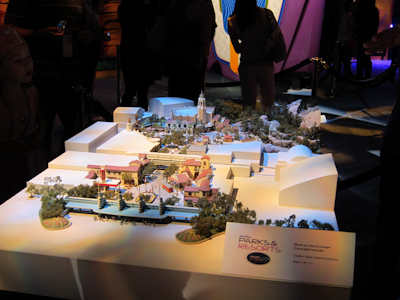 It features the Carthay Circle Theater, which apparently hosted the world premier of Snow White and the Seven Dwarfs. If you were at the MND previously, you may remember the giant letters spelling out CALIFORNIA. Those are gone. But funny story there–one time a friend was coming in from out of town and I went to meet her at the park. I picked the most prominent thing on the Esplanade I could think of to meet her at, and told her I’d be by the “A” at the MND. Seriously, it wasn’t until I was actually walking up to the letters before I realized that California has two As. Dude. 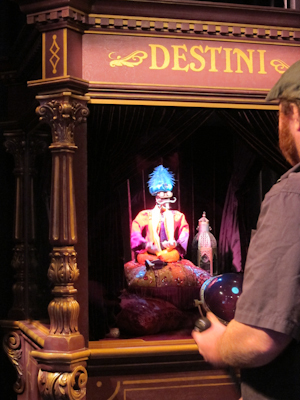 The Amazing Destini is a prototype of the latest technology in audio-animatronic figures. You had to wait in line to see Destini, so of course I did. He was a fortune teller in a booth and spoke to each person individually. He was all curtained off too. The Carousel of Projects was really big on the Dramatic Curtain front. 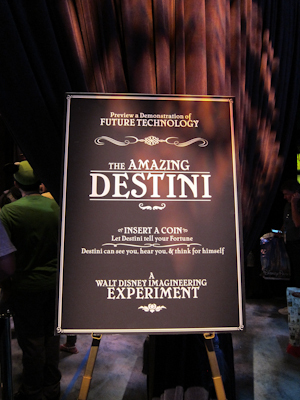 What made Destini so special was his ability to see and respond to people. 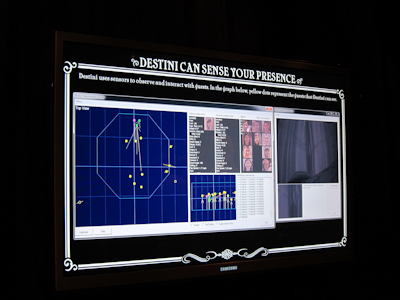 Through the magical use of technology, Destini could sense your face and the faces of many people around you. He could recognize when you were smiling or pulling some other kind of face, or dancing, or whatever, and respond appropriately. This looks like it should be a part of Tomorrowland, but it's actually real! After waiting my half hour or so, I got in to see The Amazing Destini! Who looked quite a bit like Pepe the Shrimp in the Muppets. He was very fun and told my fortune, which is that I’m going to be rich. It also takes your picture and prints it out for you, though mine did not turn out well. Apparently Destini has a ways to go on the photograph front. But still, it was super cool. 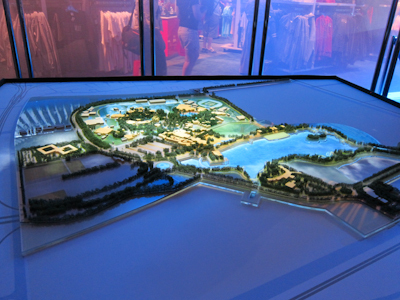 I can’t wait to see it actually integrated into the park, though that seems like several years away. For now it was just a lot of fun. 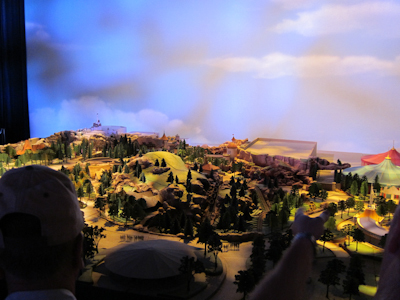 There was also a small room with pictures of the construction of Cars Land but I was running short on time so I skipped it. And this is what I took pictures of at the Carousel of Projects! 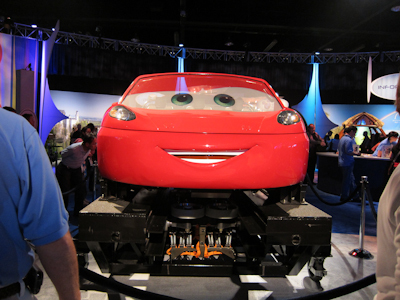 I liked the Test Track ride at WDW, but I think Radiator Springs Racers is going to be better. I think having the good story to go with the ride, and familiar characters, will make this ride 10X better than Test Track. All the thrills plus good Disney Magic (and Pixar). Oh, I definitely agree! The ride technology is the same, but RSR is going to massively bump it up, like the difference between Buzz Lightyear and Toy Story Midway Mania. Fun stuff! Even if The Mouse Next Door isn’t as magical I’m willing to bet CarsLand will be pretty awesome! 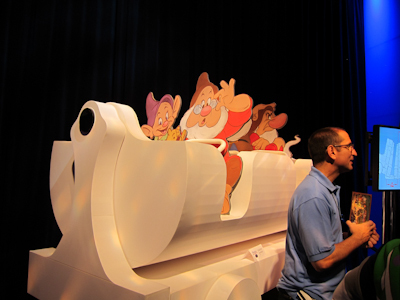 Did you get to see the interactive Mickey? We were starving and didn’t wait in the line for it, but no one could really explain to me what the heck it was. I didn’t either :(. The cast member said the line was about a half hour and I wanted to get in line somewhere else. I obviously need to get with the lingo! I’m assuming the Mouse Next Door is California Adventure? But what is the Mouse-in-Law? The Mouse-in-Law is Disney World in Florida! :). And you’re right about CA Adventure.